A 25-minute is chock full of interesting recipes, cookware and tips. When I first heard the Huron County Museum was going to hold a Delicious exhibit I was very excited. Why? Because it’s about food. Anyone who knows me, knows that I love food; I love eating, cooking, baking. I love sweet, salty, savoury. I. Love. It. All. 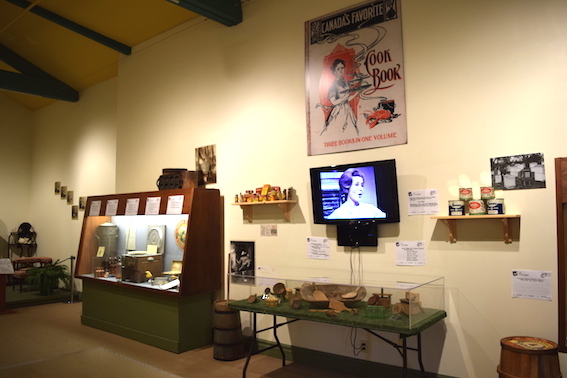 The Delicious exhibit combines a look at favourite foods from our ancestors with cookbooks and kitchen items from the Huron County Museum & Archives Collection. Will Kernohan, acting assistant curator, told me they wanted to create an exhibit that added a community engagement piece. 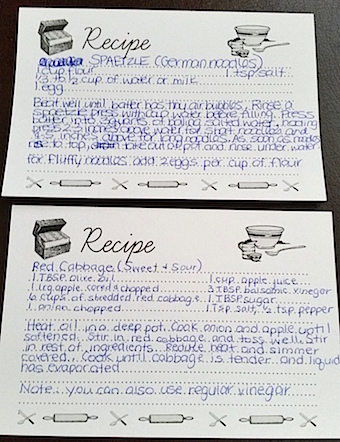 In all, 70 people have donated recipes for display. As soon as I walked into the front doors on opening day I could smell the coffee, sweets and delicious spread of cheese wafting down from the second floor. Scattered in the mezzanine were round tables covered in adorable red and white checkered table clothes where visitors could sit and enjoy the food spread provided. But where was the food?! I found the source in a separate room on the same floor; a sampling of locally produced foods. 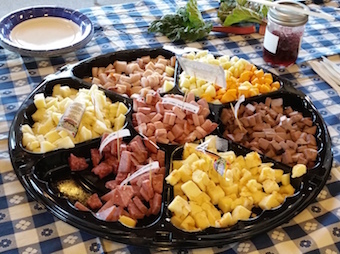 Included were coffee (Coastal Coffee), maple syrup (Robinson Maple Syrup), donuts, cheese (Pine River and Blyth Cheese), bread (Burdan’s Red Cat Farm & Bakery), salamis (Metzger’s), preserves (Bayfield Berry Farm) and apples (Laithwaite Apple Park). 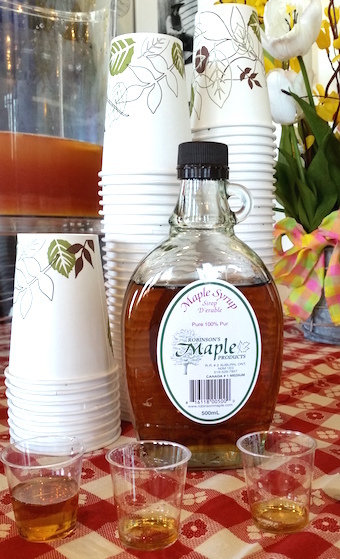 The sampling of local products was only available opening day. 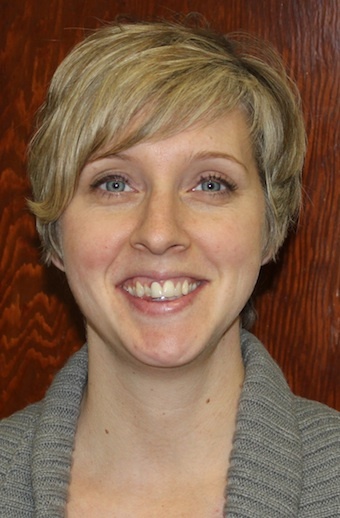 Huron County Museum Registrar Patti Lamb advised me there are 200 artifacts and cookbooks on display. 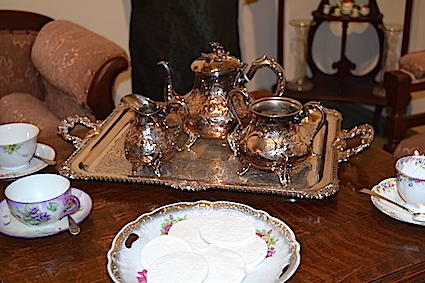 The oldest ones are the wooden “Bread and Dough Mixer and Storage—Made by William Johnston in 1860”; the silver tea services circa 1840s; the hand egg mixer circa 1881; and the pink Victorian furniture circa 1880. There is also a wonderful display for children to come and interact with. 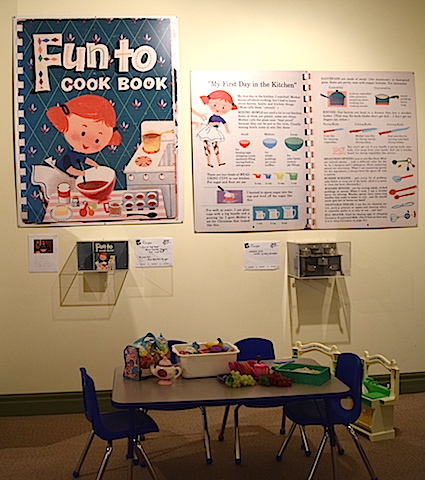 The original cookbook was provided by local resident Rhea Hamilton Seeger: Fun to Cook Book (1960). 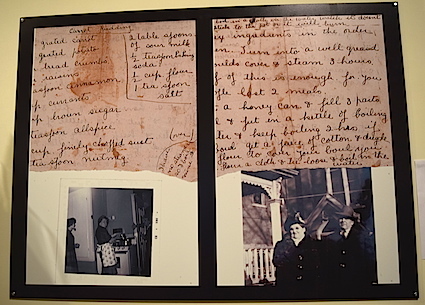 Photo on left side of this is a picture of local Goderich mother making Christmas pudding, photo on the right is a picture of grandmother who developed the Christmas pudding recipe. I love the picture blown up as it shows how well used it is with the stains on the corner. That’s my kind of recipe. One of my other favourite pieces was watching the 25-minute video that was compiled of all the different types of recipes, cookware and famous people like Julia Child providing tips. At the end of the video there is a special appearance (you’ll have to watch to see who it is) and a recipe is made from one of the ones found at the Museum. The recipe originates back to 1890 created by dispensing chemist F. Jordan. There is still lots of time to submit your own recipes. 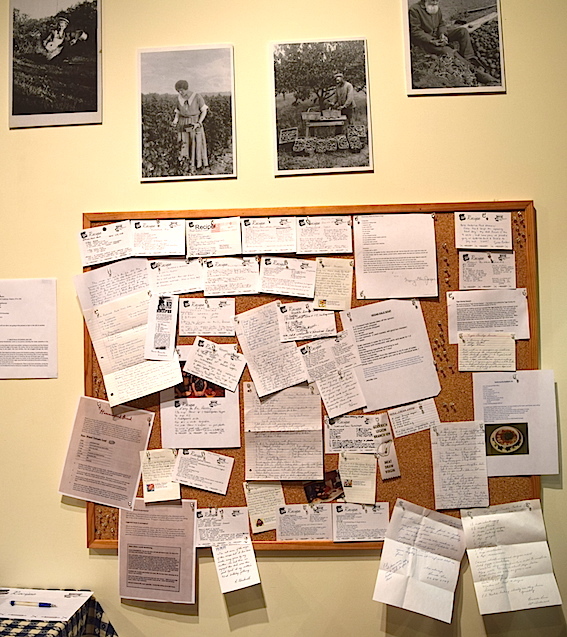 You can email it, or my suggestion is to visit the exhibit and while you’re there add your photocopy of the recipe on the recipe board. There was so much history in that room, it’s too hard to share it all with you. You’ll have to go check it out yourself. The exhibit is ongoing until Sept. 13 so you have plenty of time. Click here for details of admission fees and hours.